As sociologists of science such as Bruno Latour (1991) and critical political ecologists have persuasively argued, the separation of nature and culture is an artifact of modern society which does not hold up to closer scrutiny. In a forthcoming workshop paper, I argue that nature protection practices are implicated in the creation and perpetuation of a spatial separation of ‘nature’ and ‘culture’ which may hinder the development of adaptive approaches to the management of socio-ecological systems. I will present the paper (abstract below) at the forthcoming workshop of the German working group on landscape research (Arbeitskreis Landschaftsforschung). The workshop is organised by Kira Gee (University of Liverpool) and Martin Döring (University of Hamburg) and will take place at the Institute of Geography in Hamburg. The workshop focuses on sea, coast and river landscapes and aims to explore theoretical, methological, planning and empirical aspects. (The German title is: Meeres-, Küsten- und Flusslandschaften: Theoretische, methodische, planungspraktische und empirische Zugänge für die Analyse von Wasserlandschaften). My own paper represents the first, conceptual output of my new reseach focus on metageographies and spatial frames in coastal management which will focus empirically on the trialteral Wadden Sea region extending from Esbjerg in Denmark to Den Helder in the Netherlands abd encompassing the North Sea coasts of Schleswig-Holstein and Lower Saxony in northern Germany. Our understanding and perception of the social world is underlain by culturally embedded spatial structures or metageographies which help us at an unconscious level to order our knowledge of the world. Research in political geography and spatial planning has pointed to the dominance of state-centric ‘container space’ metageographies in shaping the underlying geography of both the social sciences and planning practice. This paper examines the role of such metageographies in the construction of another form of container space; that of the trilateral Wadden Sea as a bounded space located in front of the dyke-protected coastline. In this context, a sharp spatial distinction has been established between a natural landscape in front of the dykes and a cultural landscape behind the dykes. 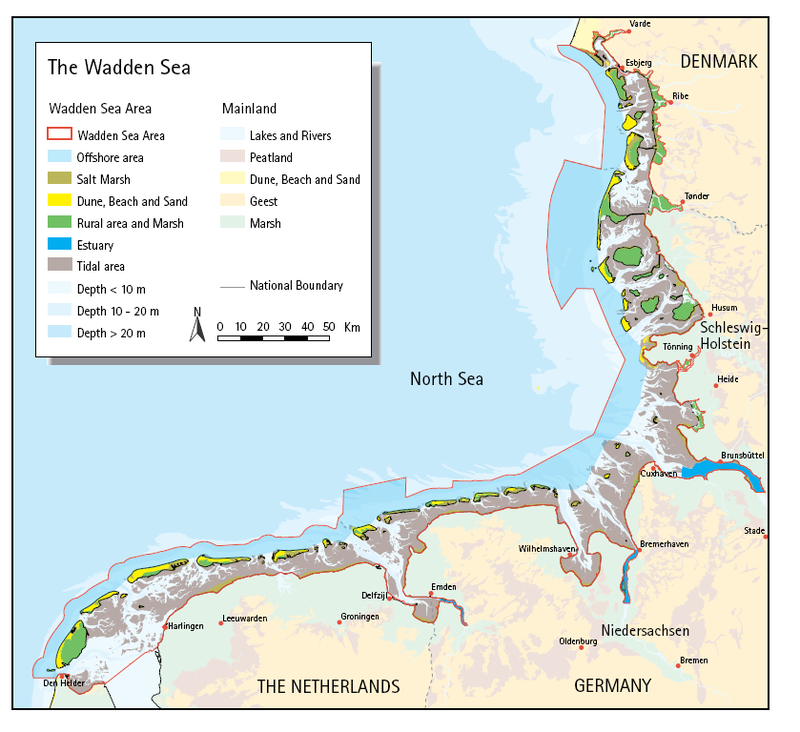 This distinction, although in practice contested, continues to play a significant role in the institutional-discursive construction of the Wadden Sea Area and Region. The paper argues for greater attention to the ways in which nature and culture become separated in the discursive construction and institutionalisation of landscapes and the role of underlying metageographies in the production and reproduction of the socio-spatial compartmentalisation of nature and culture. This entry was posted in Coastal Management, Conferences and tagged coastal management, cross-border cooperation, Denmark, Germany, landscape, metageographies, Netherlands. Bookmark the permalink. Baby geographer in the making here: in your writing are you implying that it is important to recognise human systems and ecological systems as complex and inherently coupled, in order to produce effective management & development strategies? ‘Naturally’ geometric human settlements erase natural shapes and build a divide. Would I be able to cheekily ask for a link to your paper, if it is yet available to the public? thanks for the comment. I do not follow the socio-ecological systems approach as you suggest here – coupled human and ecological systems . I don’t think societal and cultural aspects (including socio-cultural perceptions of nature, culture and landscape at the coast) can usefully be understood in terms of human systems. This type of approach tries to incorporate the social sphere within a natural science epistemological framework. In my current writing I focus on how specific boundary lines at the coast create a false spatial separation of natural and cultural landscapes which in turn serve to reproduce dichotomous thinking. The challenge of integrating across disciplinary perspectives incorporate cultural values in addition to natural science knowledge is much greater than a coupled systems approach would suggest. P.S. although i respect your right to remain anonymous if you so wish, it would be good to know more about your background and where you are coming from.